And the winner/loser of this suburban election is . 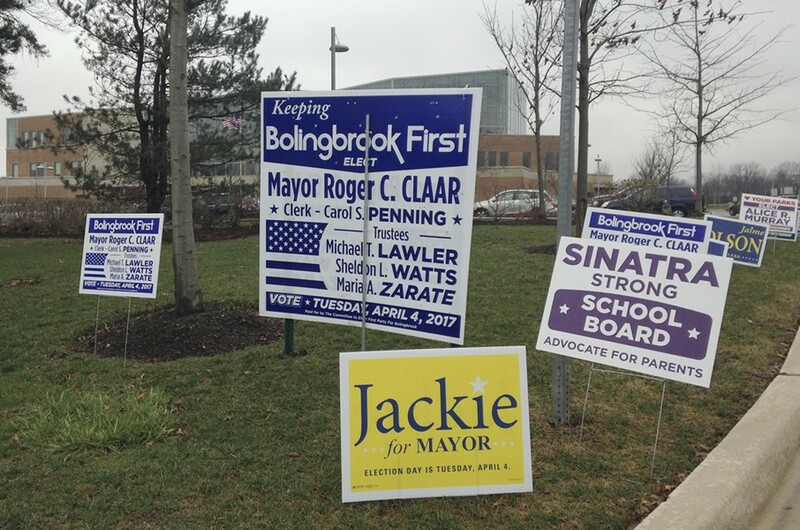 . .
Campaign signs for the Bolingbrook mayoral race littered the lawn outside the Fountaindale Public Library earlier this week. With the results from Tuesday's suburban municipal elections finally tabulated in several razor-thin races, the time's come for me to write another one of my world-famous stories about who really won and lost—aside from the candidates, of course. As everything in Illinois is a proxy fight for something else. So a mayor's race in a small suburb is really an indication of who's up and who's down in the titanic struggle between Governor Bruce Rauner and house speaker Michael Madigan. Or whether Donald Trump's losing his sway over swing voters. So let's dive right in, starting with . . .
You might say Claar's an ideal poster boy for the kind of career politician Rauner wants to eliminate with term limits. Except Claar's a Republican. So unless Rauner's got some secret anti-Claar TV ads in the hopper somewhere to run alongside his anti-Madigan ones, it seems pretty clear that Rauner only wants term limits for Democrats. Claar is also a big supporter of President Trump—he hosted a Trump fund-raiser last year at the Bolingbrook Golf Club. As such, his reelection was viewed as sort of litmus test on Trump's popularity—even the New York Times covered the race. His opponent was Jackie Traynere—a Will County commissioner—who called on voters to send a message to Trump by bouncing Claar from office. Winner: Trump. Although this was the closest anyone's come to unseating Claar, so don't get too cocky, Mr. President. Orland Park. In this race, a 24-year-incumbent, Dan McLaughlin, was ousted by a Republican businessman named Keith Pekau thanks to at least $200,000 worth of campaign ads created by Dan Proft, who runs the Liberty Principles PAC. Proft fired up Orland Park's sleepy electorate with mailings blasting the village board for making the mayor's job a full-time position, thus upping McLaughlin's salary from $40,000 to $150,000. Man, with a ready-made issue like that, I could have successfully run Pekau's campaign with Rauner's money. Yo, Mayor McLaughlin—learn from Rahm. Getting the board to give you a raise is like releasing a video showing a policeman killing an unarmed teenager. It's best to do after the election. Evanston. Voters there overwhelmingly approved a referendum that raises their taxes to pay for their public schools. This is part of Rauner’s proxy war on public education—apparently, the governor has decided to bankrupt all the schools in our state by calling for a freeze on property taxes—the lifeline of most public schools—while failing to increase state education aid. It's nice to know that there's at least one community in the area where the grown-ups reign. Winner: The schoolkids of Evanston. Finally, I couldn't let this moment pass without mentioning our very own Mayor Rahm—I haven't forgotten you, Mr. Mayor. He was nowhere near a ballot on Tuesday. But on Wednesday, he felt compelled to win a little publicity by unveiling a new graduation requirement. From here on out, CPS high-schoolers can't get a diploma until they prove they have some sort of postgraduation plan, like acceptance into college, trade school, or the military. It's one of those ideas that sounds good for someone nowhere near CPS. But it ignores the fact that CPS is broke. Basically, Rahm's dumped another unfunded mandate on beleaguered school officials who barely have enough money to finish out the school year. Anything for a photo op and a glowing write-up by some hapless out-of-town pundit. Losers: The parents, students, teachers, and taxpayers of Chicago—as usual.